The DB Series Multicouplers are receive antenna distribution products featuring custom RF filters, variable attenuation controls for each input, dual redundant internal power supplies and built-in self-protecting bias power supplies for remote line amps. The DB series multicouplers serve as the head end for the receive antenna system. Antennas are connected to rear-panel input zone connections. Each input features overload protected remote bias power, selective from front panel switches. The associated indicators depict the health of the remote line amp (connected, disconnected or shorted.) 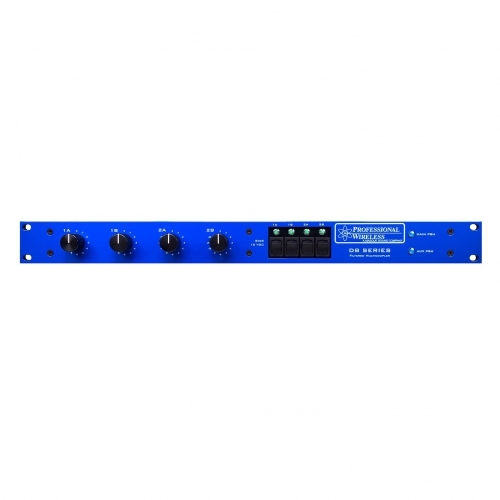 Each input has an associated front panel variable attenuator that is used to tailor the amount of gain from that antenna in order to balance the overall system. The RF signals are then combined, filtered and amplified before being presented at the rear panel for connection to individual wireless receivers.